Sociobiology is the study of the biological basis of social behavior using evolutionary principles. 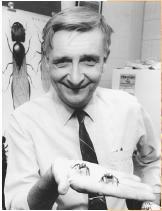 The term was coined by a prominent entomologist E. O. Wilson in his book Sociobiology: The New Synthesis (1975). Wilson pointed out that just as physical characteristics such as beak length and fur color could be subject to natural selection, so too could aspects of social behavior. The field of sociobiology was part of a broad conceptual shift during the late 1960s and throughout the 1970s. Sociobiology looked closely at the nature of interactions between individuals, replacing a cooperative view of social behavior with the idea that more often, from an evolutionary perspective, individuals should behave in their own self-interest. It was one of several fields that emphasized the genetic basis of behavior in all animals, including humans. In doing so, sociobiology shed light on a number of important aspects of animal behavior, including the evolution of altruism, the occurrence of infanticide and sibling rivalry, parental care, and social and mating systems. The extension of some aspects of sociobiology to humans initiated a controversy, which continues today. Wilson's original focus was on the insects, such as ants, bees, and wasps, a group that commonly contains species that are eusocial. Eusocial species typically live in large highly cooperative groups or colonies, with reproduction limited to a very few members. Why would individual worker bees defend a colony from intruders, feed offspring that belonged to others, and forgo their own reproduction? Such altruistic or helping behavior puzzled biologists. If natural selection works on behavior just as it works on other traits, why should individuals expend energy or time helping others survive or reproduce when that effort may reduce their own chances of reproduction? In 1964, William Hamilton developed the idea that individuals help their relatives because relatives share genes. Just as genes may be passed on by direct reproduction (producing offspring yourself), "your" genes can be passed on by increasing the reproduction of close relatives. In the social insects, cooperative behaviors associated with eusociality make evolutionary sense because these species have an unusual system of genetic relatedness, making colony members very closely related. An evolutionary approach has shed light on other puzzling aspects of behavior. Infanticide or infant killing by males in social monkeys is now believed to be a strategy used by males to speed up female receptivity and prevent females from spending energy on offspring fathered by competing males. Using an evolutionary approach, even close relatives can have conflicts of interest. Natural selection is expected to favor offspring that compete with each other for food (sibling rivalry). Parents should care for offspring, but offspring may demand more attention and energy than parents are willing to give. Parents, after all, must balance the amount of time and energy they devote to any single offspring with demands of other offspring and potential future offspring. E. O. Wilson, founder of sociobiology. Sociobiology has addressed broad questions concerning the social systems or kinds of groups in which species are found. For example, if groups of certain sizes have a greater likelihood of detecting predators, then they should be favored by natural selection. This may explain herding and flocking. An evolutionary approach to the study of mating systems has highlighted potential conflict of interest between males and females. Females produce few eggs, while males make many sperm. Because of this, females may be more selective in their choice of mates. In each of these cases, the field of sociobiology and an evolutionary approach to behavior led to insights that otherwise would have been missed. The last chapters of Wilson's book extended the study of sociobiology to humans. Although not the core of his text, this final chapter generated heated controversy over the nature of human social behavior and, in particular, the role of genes versus environment in determining human behavior. Some scientists considered Wilson's ideas dangerous. Genetically determined behavior seems to leave little room for free will, and downplayed the importance of the social and physical environment within which individuals grow and develop. Since the publication of Wilson's book, more evidence has emerged that aspects of behavior have a genetic basis. With the increasing evidence from genetic and inheritance studies, however, comes an appreciation of the critically important role of the environment. Biologists now appreciate that the environment works together with genes in complex ways to affect behavior. Hamilton, W. D. "The Genetical Theory of Social Behavior: I and II." Journal of Theoretical Biology 7 (1964): 1–52. Wilson, E. O. Sociobiology: The New Synthesis. Cambridge, MA: Belknap Press, 1975.